Home / Editor's Choice, Entertainment News, Featured Articles, Gossip and Drama, News, Politics / It is a crime for anyone especially KIKUYUs to wear this tshirt to RUTO’s function (PHOTOs). 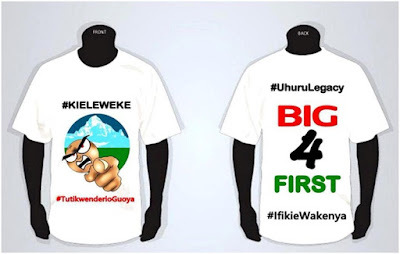 It is a crime for anyone especially KIKUYUs to wear this tshirt to RUTO’s function (PHOTOs). Thursday, September 13, 2018 - A young man was arrested by Ruto’s security in Nyeri and handed over to the local police after he attended a function he was headlining dressed in a tshirt written Kieleweke, TutitwedekerioGuoya (which translates to, Let it be understood that we won’t be intimidated through fear). According to Nyeri Town MP, Ngunjiri Wambugu, Ruto’s security is cracking down on anyone who wears this tshirt to his function. Ngunjiri Wambugu questioned why Kenyans are being intimidated by Ruto saying, “HERE IS THE T-SHIRT DEEMED TO BE ANTI-RUTO? HOW? WHY? Here are photos of the t-shirt that has been banned in Ruto’s functions.